This model has been discontinued as Weber has removed the Gourmet BBQ System from their gas grills. The closest match for this grill is the Weber Spirit E-310. Typically Home Depot sells a special or deluxe version of some of the line of Weber gas grills. 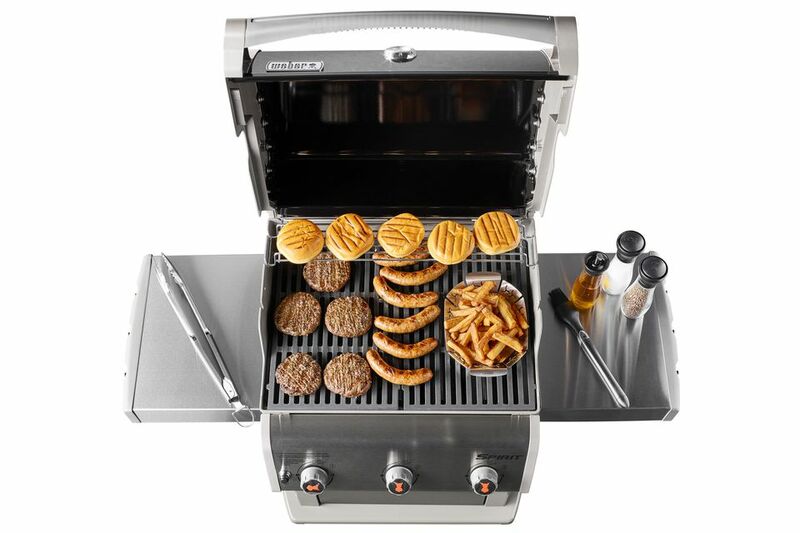 For 2014, the Spirit grills have Weber's Gourmet BBQ Accessory System added for no extra price. Similar to the standard Spirit E-310, this model has a special porcelain coated cast iron cooking grate with a removable center piece that can be swapped out for a large number of accessory cooking equipment including a pizza stone, chicken roaster, and the griddle that is included in this package. For those that want more than basic grilling, the Gourmet BBQ System from Weber offers almost unlimited potential for accessories. While this grill comes with a standard griddle attachment there is a host of other accessories available ranging in price from around $35USD to $55USD. What this special version offers is not only $100USD off the MRSP for the comparable model but a free accessory system. Obviously, Home Depot and Weber believe that consumers will be willing to add those additional pieces and, therefore, generate additional sales, but for the consumer, this is a tremendous value for a good grill. This is primarily a very basic 3-burner gas grill. The three burners generate 32,000 BTUs of heat under 424 square inches of porcelain-coated cast iron cooking grates. This is not a powerful grill and the preheat times are long. However, the grates hold a lot of heat and allow for good heat transfer. This grill will do a good job of grilling a steak or burgers. The temperature range is wide, so low-temperature cooking is very good. The 3-burner design gives enough space to indirectly cook a whole chicken or a roast efficiently. The construction is good. Weber abandoned higher quality stainless steel in favor of price control, so this doesn't have the durability of Weber of the past, but it is still a well-made grill. The majority of the body is enameled steel, something Weber is very good at and I would recommend this black grill over the more expensive stainless steel body paneled Spirit S-310.